Ten major supermarket chains in Japan's Kochi Prefecture staged a "shopping bag reduction contest" from October 1 to November 30, 2012. Although the supermarket chains have succeeded in reducing use of disposable shopping bags by around 30 percent through their individual efforts, achieving further reductions has been difficult. The 10 companies tried to overcome this problem together by urging customers to cooperate. A total of 77 stores participated in the contest. Each store competed to achieve the highest shopping bag reduction rate; the stores that achieved the highest reductions were awarded. The contest was carried out as part of "All guys (and girls) bring your bag! 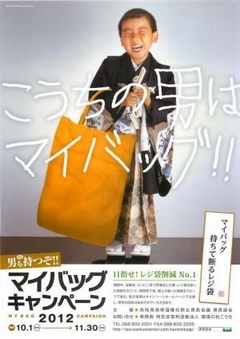 Bring Your Own Shopping Bag Campaign 2012," hosted at the same time by the Kochi Prefecture Citizens Committee for Global Warming Mitigation. Contest participants in the campaign consisted of members of neighborhood associations, clubs, and other community organizations, assembled in groups of two people or more. During the contest period, each person counted the number of times that they checked out without using the plastic shopping bags offered by the stores, added their numbers to the group, and submitted their group numbers to the secretariat of the citizen's subcommittee of the committee. The results were posted on the secretariat's website, and the group that had the highest reduction rate was awarded. Forest Power: "Forests Help People. People Help Forests."